Point Pleasant senior Justin Staats (6) chases down a loose ball as teammates Chase Walker (12), Peyton Hughes (18) and Kaydean Eta (22) look on during the first half of Monday night’s Class AA-A Region IV, Section 1 opening round match against Williamstown in Point Pleasant, W.Va.
POINT PLEASANT, W.Va. — The scoreboard wasn’t reflective of the effort. The Point Pleasant boys soccer team had its 2017 campaign come to a disappointing end Monday night following a hard-fought 1-0 setback to visiting Williamstown in the opening round of the Class AA-A Region IV, Section 1 tournament held at Ohio Valley Bank Track and Field in Mason County. 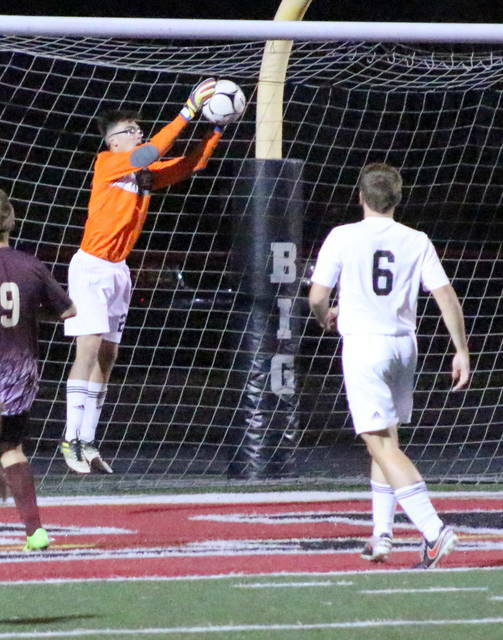 The fourth-seeded Black Knights (9-11-1) put together a fine overall effort in their final 80 minutes of the season, but the hosts had one brief unlucky span in the second half — and the fifth-seeded Yellow Jackets (9-11) ultimately made them pay for it. 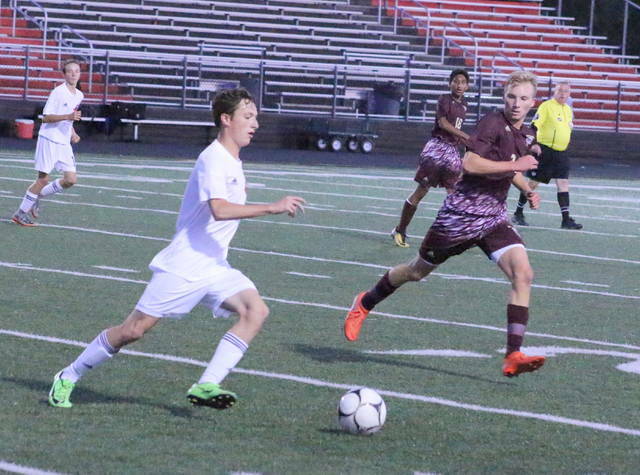 Scoreless through 60-plus minutes of play, WHS caught a break as Dylan Cosner gained possession on a breakaway down the right side of the box. Cosner fired a shot to the opposite post from about eight yards out, and the ball went untouched into the back left corner of the net. Cosner’s goal came with 17:36 remaining in regulation while giving the guests a 1-0 advantage. Despite a handful of really good offensive looks in the second half, Point Pleasant found itself unlucky in finding the back of the goal. 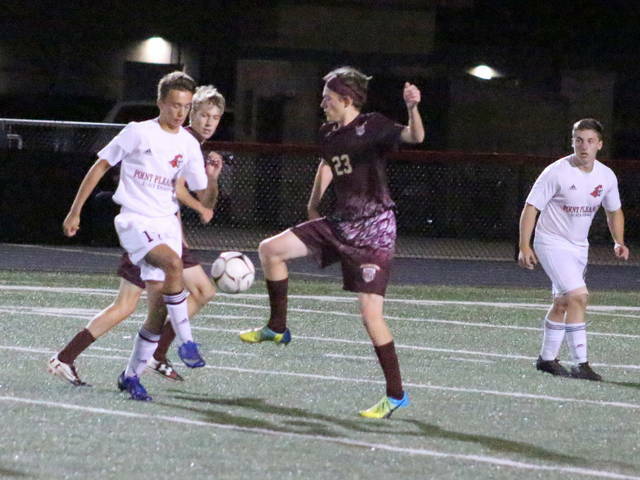 Adam Veroski had an open shot in front of the net from about 10 yards out, but the attempt bounced off the top of the cross bar and rolled over the back of the net during the early moments of the second half. Cole Walker also had a ball dropped to him in the center of the field from 22 yards out, but his shot sailed high with around 10 minutes left in the game. Both teams had their opportunities as the Jackets outshot the hosts by a 15-12 overall margin, which included an 8-6 edge in shots on goal. 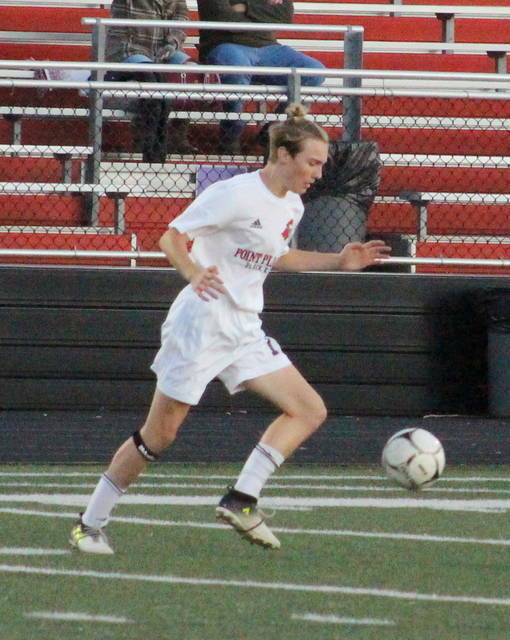 The Red and Black had all three corner kick chances in the physically-testing match, which featured 13 fouls — six of which were whistled on Point Pleasant. Williamstown was also given a yellow card early in the second half of play. After a 9-12-1 campaign last fall, the Black Knights had plenty of obstacles to overcome in at least matching last season’s win total — particularly on the offensive side of the field. Point Pleasant, however, actually fared better offensively this season and also managed to post seven shutout victories along the way. Given those kind of seasonal accomplishments and the effort given on Monday night, second-yard PPHS coach Chip Wood found it a little difficult to see this campaign come to an end — particularly given how well his defense played. “Honestly, Williamstown scored a high-quality goal. It wasn’t like we gave it away, the kid just made a great shot,” Wood said. “They put together two or three really good passes there and it worked, but it wasn’t that our defense broke down. It was just a good play that worked against us. Even tougher for Wood, however, was having to say goodbye to seniors Cole Walker, Jacob Hussell, Justin Staats, Alex Carlisle, Austin Nott, Chase Walker and Jacob Bryant after such a well-played match. “I told the seniors after the game that they made me wish I hadn’t taken a break from coaching and that I would have had them for four years because they are simply those kind of kids,” said Wood. “Considering how much we lost from last year and what we were able to accomplish, I hope that those seniors take some pride in what we’ve done this fall. Zach Rediger made seven saves in net for Point Pleasant during the loss. Joseph James stopped six shots in goal for Williamstown.